Many people enjoy being in or around water once the weather starts to heat up. Whether it’s at the neighborhood pool, the beach, or a nearby lake, swimming or taking part in other water sports is a great way to pass the time on a hot summer day. What most people don’t stop to think about is that water can actually be very dangerous if certain precautions aren’t taken. This guide was created to give you ways to stay safe when you’re in or near the water. How can water be dangerous? Water can be dangerous even if you’re a good swimmer. Drowning is the 2nd leading cause of accidental death among children and young adults. Water accidents can happen when you least expect them – friends may playfully push someone into the water only to find our later that the person can’t swim. However, some accidents may involve alcohol or other illegal substances. Water can give you muscle cramps or cause fatigue and, make it difficult for you to swim. Strong riptides and undertows can pull swimmers into fast moving currents that can pull them out very far from shore. How can I prevent drowning? Take swimming lessons – Many neighborhood pools and community centers such as the YMCA, offer swimming lessons for free or at a reduced rate. It’s never too late to learn! Knowing how to swim is an important skill that everyone should have. These classes will also teach you water safety techniques. Swim with a buddy – Swim with someone who is a good swimmer. Never go into deep water unless you are an experienced swimmer. Swim where lifeguards are on duty just in case anything happens. Swim or take part in water sports when you are alert, never when you’re sleepy or have used drugs or alcohol. Know your swimming area – Swim only in places that you are familiar with. For example, some rivers, lakes, and harbor ways can have strong currents or spots where the water level suddenly becomes deep. Don’t dive in shallow water or unknown water – You could easily hit your head and permanently damage your spinal cord. Don’t be bullied – Sometimes friends will attempt to tease you into doing something that you know isn’t safe. Don’t do anything in the water that makes you feel uncomfortable. Remember, your safety is most important. Keep a look out for your friends – If you’re a good swimmer but your friends aren’t, make sure they know their limits, and keep an eye on them in the water. Don’t drink & swim – This seems obvious, but drinking alcohol (or using drugs) dramatically increases the risk of injury – especially when diving. If you’re in the water, it’s probably hot and sunny. You’ll also need to think about how to protect yourself from the heat and the damaging rays of the sun. Wear waterproof sunscreen. While you are swimming, boating, waterskiing, or doing other water sports, you are getting both direct and indirect sun exposure. Rays that bounce off of the water and reflect on your skin are typically very strong and can cause severe sunburn. Apply waterproof sunscreen (SPF 30) and reapply every 2 hours. Keep hydrated. Hot weather can cause overheating and dehydration, especially if you’re very active and forget to drink enough fluid. Signs of dehydration include dizziness, shakiness, and lightheadedness, and your urine will be dark and concentrated. To avoid dehydration, drink plenty of water or flavored water based drinks instead of soda or other caffeinated beverages. Don’t stay in cold water. Make sure that the water isn’t too cold. Very cold water can lower your body’s core temperature and cause chills, muscle cramps, and later, hypothermia – a serious condition that requires medical attention. If the water is no longer refreshing and you’re chilled, get out! You can always go back in later. What’s the deal with diving? Always follow the “No Diving” signs at public swimming places such as lakes, ponds, public swimming pools, and the beach. These signs mean that it’s NOT SAFE to dive (particularly head-first) into the water. The water is probably too shallow, or there could be sharp rocks or other objects in the water that you can’t see. Don’t dive unless you are 100% sure that it’s safe. 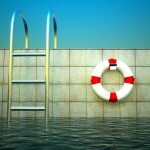 If you are diving in a pool, make sure the water is well over your head. The biggest mistake (which can cause spinal cord injuries) is diving in water that is too shallow. If a person’s spinal cord is injured, it can leave them permanently paralyzed. Some diving injuries can even cause death. It’s just NOT worth the risk. Swimming and other water sports can be a lot of fun. Make sure that you always take precautions before you go into the water. This way you’ll be able to enjoy your time in the water even more.